Bridger Bishop earned a Bachelor’s Degree in History with Honors from the University of Montana. He also has a Master’s Degree in Classics from the University of Colorado and an MAT (Master’s in Teaching) in American History from the University of Illinois- Chicago. Bridger’s research focuses on environmental and labor history in the northwestern U.S. During his time at UNLV, he has been active in UNLV’s Public History program. He helped to organize and create the Line in the Sand exhibit on the history of the Culinary Union. He served for a year as the deputy director of Preserve Nevada and also collaborated with Nevada State Parks and the Nevada State Historic Preservation Office on the creation of a more in-depth history of Spring Mountain Ranch State Park. Dissertation Research at Western Kentucky University. Currently a Ph.D. Candidate in the UNLV History Department, Shae Smith Cox earned her M.A. in American History from Oklahoma State University in 2013. She studies the Civil War with an emphasis on material culture and memory and is minoring in Public History. Shae interned with the Mob Museum’s content department during the summer of 2016 and worked as the project manager for the Fall 2016 exhibit Ready to Roar. She coauthored the grant application for the Nevada Humanities Mini Grant awarded to the UNLV Public History Program in 2016. She returned to the Mob Museum to work as an interim curator during the Summer of 2017. Shae is the recipient of the Spring 2018 Summer Doctoral Research Fellowship, the History Department's Outstanding Doctoral Student Award, and the John Pine Memorial Award for the National Phi Alpha Theta Organization. She is a member of the Society of Civil War Historians Graduate Connection Committee. Shae holds the position of Deputy Director for the nonprofit organization Preserve Nevada and is the local student representative and assistant coordinator for the 2019 Local Arrangements Committee for the Western History Association. Neil Dodge earned his Master's degree from the University of New Mexico in May 2016. He is currently attending the University of Nevada, Las Vegas for a Ph.D. in the history of the North American West. His scholarly focus is on American Indians and the formation of kinship networks prior to contact with the American state. He has been involved with two public history projects. The first project was the recovery of indigenous voices from the Fred Harvey Indian Detours. The second project collection and preservation of family oral histories and memories about military service in Korea and Vietnam. Examining a celluloid brush for Ready to Roar. Anthony Graham received his M.A. in history from CSU East Bay in 2013 and his B.A. in History from the UC-Davis in 2009. He examines the environmental history of the Far West. His research interests include: the study of sustainability, environmentalism, technology, land art, ecology, environmental perceptions, historic preservation, public memory, and museum studies. He is the recipient of the UNLV History Department 2016 “Outstanding Seminar Paper Award," the Lodge/Clark Scholarship for Academic Excellence, and the Hal Rothman Doctoral History Student Scholarship. He has worked with the National Park Service on the Teaching with Historic Places Project and the Mob Museum as student Director of Education for Ready to Roar. He currently works with the Nevada Site Specific Resource Board advising on environmental clean up at the Nevada National Security Site, formerly the Nevada Test Site. Kalra, interviewing legendary fiddler Tom McCarroll. History and Archives Team Leader, Cumberland Trail State Scenic Trail. Louie Bluie Festival, June 2007. Ajay Kalra exceeded his feline quota of nine lives somewhere down the long and winding road on the pursuit of his American music muse. His latest stateside appearance has seen him pick up the chase in the rolling hills of Kentucky, where he received an MA in folk studies in 2017 and a second Berea College Appalachian Sound Archives Fellowship in 2016, and the wide open western spaces of Nevada, where he is pursuing a second PhD in cultural history of the West. In previous avatars he was a doctor in New Delhi (where he was awarded a silver and two gold medals), a bluegrass mandolinist in East Tennessee (where he also served as assistant editor of the Encyclopedia of Appalachia and received an MA in Liberal Studies), and a blues and rock bassist in Austin (where he also earned a PhD in Ethnomusicology from the University of Texas). In other sojourns on a long, strange trip, Ajay has taught blues, rock, and world music courses at three US universities, and bluegrass, hippie music, and yoga in the hills of India. Proudly representing UNLV at the NCPH 2018 Annual Meeting in Las Vegas, NV. Christina Lamoureux is a Ph.D. student in the UNLV History Department. She obtained an M.A. in History from Fitchburg State University and an M.A. in Public History from Southern New Hampshire University. Christina’s research focuses on prostitution and print culture during the late 1800s and early 1900s. In particular, she is interested in exploring the language used in reference to prostitution in newspapers, moral reform literature, and other forms of print. Christina is currently using Geographical Information System (GIS) technology to map both an 1870 New York brothel guidebook and important sites of female suffrage in Nevada. Prior to her time at UNLV, Christina developed a digital exhibit using newspaper snippets to highlight references to prostitution in print from 1690 to 1930. 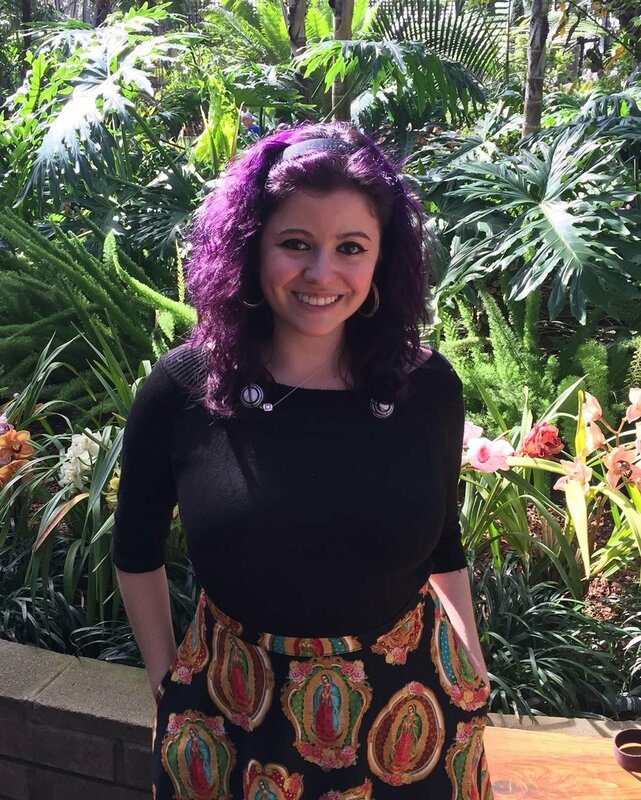 Doris Morgan Rueda is a Ph.D. student in the UNLV History Department. She received her B.A in Criminology, Law & Society from UC Irvine. She then earned her M.A in History & Digital Media from CSU San Marcos where she researched San Diego’s moral panic over juvenile delinquency and border crossings during the Cold War. Her current research focuses on the development of juvenile justice along the U.S-Mexico border and popular ideas of juvenile delinquents and criminality throughout the 20thcentury. Prior to her time at UNLV, she contributed to the digital project documenting the rise and fall of the Prohibition Bureau. James Steele is a second year PhD student in UNLV’s History Department. Originally from Los Angeles, James graduated from California State University Los Angeles with both his B.A. in American History and M.A. with focuses in American, Middle Eastern and Russian History. Currently his research interests include American Popular Culture of the Twentieth Century, International Affairs and Public History. 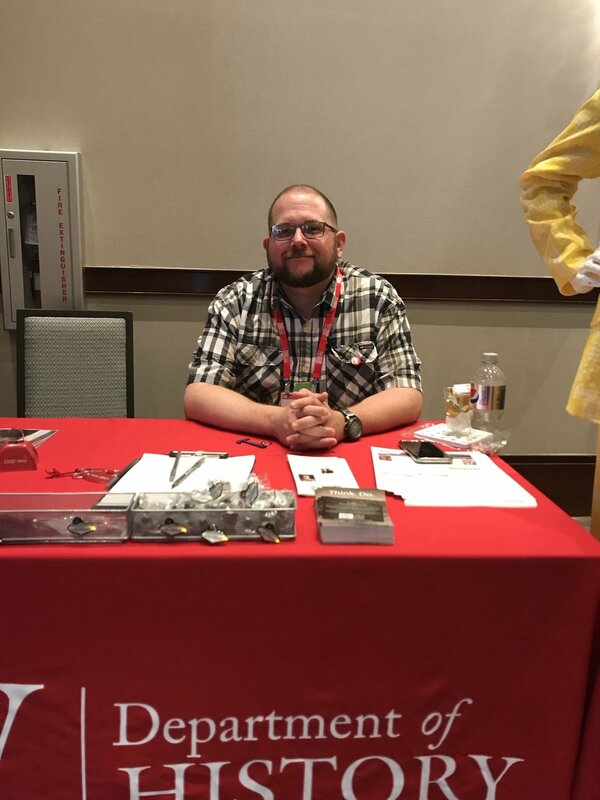 Now in his third year of hands on Public History experience that includes both in house interpretation of artifacts and outreach education he hopes to pursue a career in Public History after completing his education. Maggie Bukowski is a Master’s student in the UNLV History Department. Maggie earned her Bachelor’s in American History from UNLV in 2016. Maggie is currently working on a thesis about nineteenth-century women’s magazines with an emphasis on fashion, morality, and memory. Maggie interned with the National Cowboy and Western Heritage Museum in Oklahoma City, Oklahoma in the summer of 2016. While there, she worked with the Assistant Registrar to create housing and updated records for forty Native American headdresses as well as tracing and recording the provenance of a late nineteenth-century trousseau. Currently Maggie works at UNLV Libraries Special Collections and Archives as an Accessioning Assistant. In this capacity, she is working on processing and making available the University Archives to researchers. Lee Hanover is working on his Master's degree in History at the University of Nevada, Las Vegas. His research focuses on California Native American wage labor as it relates to family, community, and cultural adaptations to U.S. capitalism. His research methodology centers on memory studies and ethnography. For Ready to Roar, he led the research team and wrote many of the labels and background information for the exhibit. Lee looks forward to finishing his Master's degree and continuing on to a doctoral program this fall. Billy Marino is a M.A. student in the UNLV History department. He studies U.S. Environmental History with an emphasis on the Cold War, particularly the Space Race. The incorporation of memory theory and oral history methodology are integral aspects of his research. These Public History theories and methods are vital, but engaging with the public, and presenting his research is his inspiration. He has worked on multiple historical exhibits including Thriller Villa: The Man in the Mirror and Mr. Showmanship, The Liberace Garage, and Ready to Roar, contributing to the research, design, and installation of each.